Day 6: Morning visit Pashupatinath and Bodhnath. Day 7: Morning visit Bungamati. Day 8: Transfer to airport for flight to Paro. Day 14: After breakfast drive to Punakha, Afternoon visit Punakha Dzong, vernight at the hotel in Punakha / Wangduephodrang. Day 15: After breakfast, drive to Paro, Afternoon visit Ta Dzong. Overnight at the hotel in Paro. Day 17: Transfer to airport in time for flight to Delhi. Day 18: Transfer to airport for onward flight. Meeting on arrival and transfer to the hotel. Delhi, the capital of India, conceals within its bosom the remains of civilization that flourished over the last three thousand years. Since those legendary days, many dynasties and rulers have flourished on its regal soil. The legacy of that past survives in the many monuments left behind by the regents. Old Delhi's landmarks are Red Fort built by Emperor Shahjehaan in 1638 AD, Jama Mosque largest mosque in India also built by Shahjehan. Raj Ghat and Shanti van -the cremation sites of Mahatma Gandhi and Pt. Jawaharlal Nehru are on the banks of river Yamuna, behind Red Fort. Chandni Chowk, the main congested shopping hub of Old Delhi is still a major attraction to travel thru by Cycle Rickshaw. New Delhi was planned by British architect Edwin Lutyens in 1911 and was inaugurated on 13th Feb. 1931 by Viceroy Lord Irwin. The southern Delhi which saw several rulers had seven ancient cities. 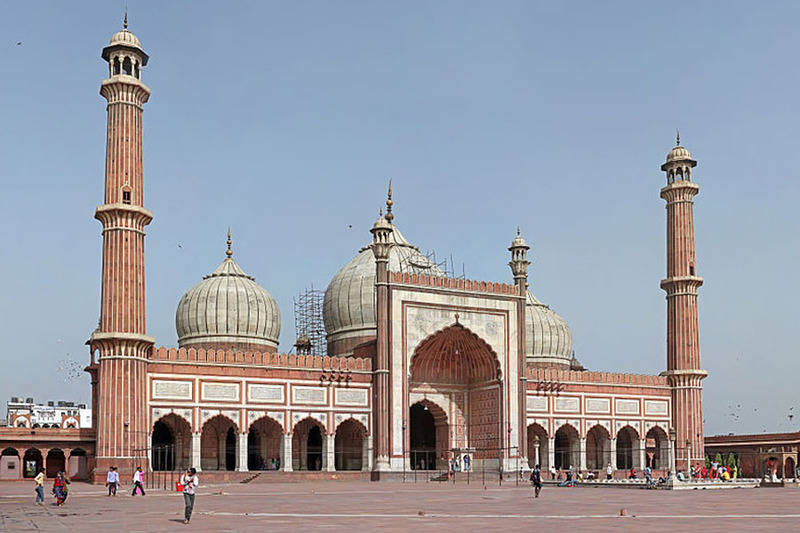 The most notably had been the Mughals who ruled Delhi from 1799 to 1849. The prominent places are Qutab Minar, one of the earliest remains of Imperial Delhi (13th century AD ) Humayun's Tomb, the fine monument believed to be forerunner of Taj Mahal . India Gate, the 42 metre high arch that was raised as a memorial to soldiers, Parliament House, President's House, Secretariat, Govt. Building and Connaught Place, the shopping hub of New Delhi were constructed during the British rule in India. Afternoon visit Taj Mahal and Agra Fort. Taj Mahal is the finest example of Mughal architecture. A UNESCO World Heritage site, this immortal monument, the inimitable poem in white marble is the true expression of love of Emperor Shahjehan for his queen Mumtaz Mahal. 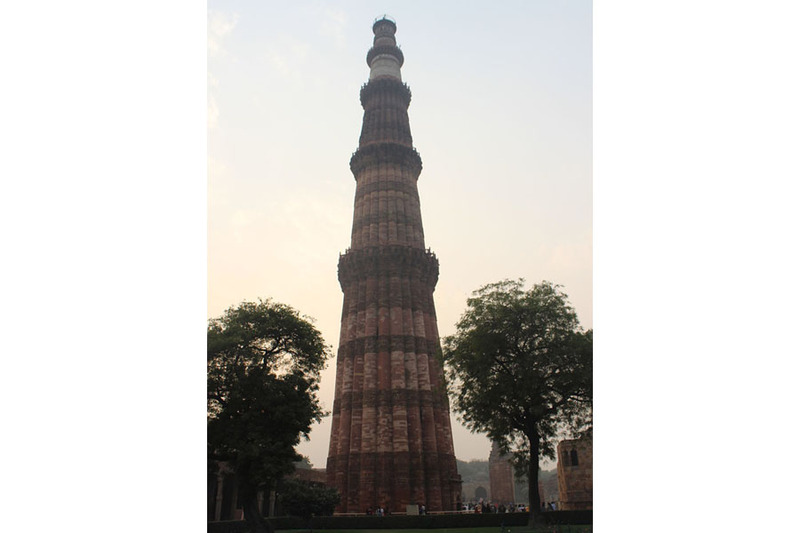 The monument was completed in 1653 AD and thousands of workers and artisans were employed. It took little over 20 years for its completion. 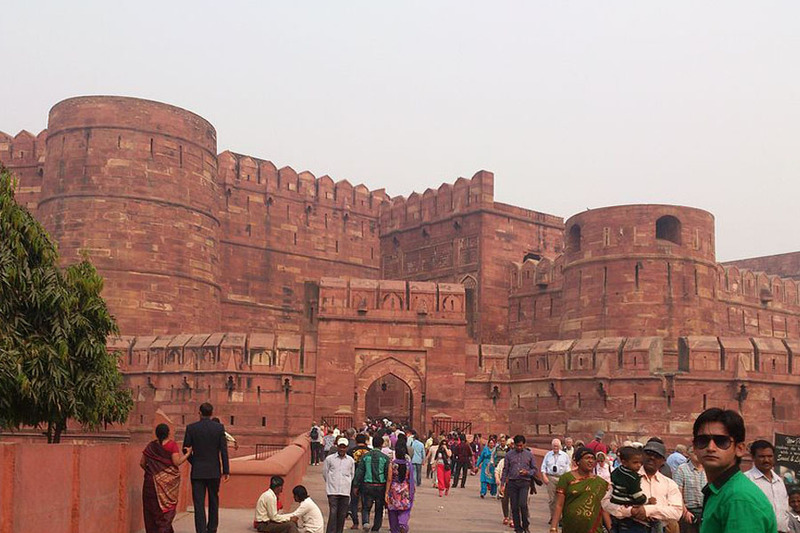 Agra Fort's importance can be judged with the great names of Mughal dynasties Humayun, Akbar, Jehangir, Shahjehan and Aurangzen who lived here. The imposing structure on the banks of the river Yamuna is replete with priceless examples of craftsmanship in the Mughal period. The beautiful pearl Mosque, Diwan-e-Am, Diwan-e-Khas, Jehangir palace, Moti Masjid are to name a few that form the part of this great fort. Morning drive to Delhi to catch late afternoon flight to Kathmandu. Meeting on arrival and transfer to the hotel. Machhendra Nath Temple, a two tiered bronze roof pagoda, Hanuman Dhoka - the historic seat of Royalty, Durbar Square which houses Teleju temple built in 1549 AD, figure of Kal Bhairav - God of Destruction, statue of King Pratap Malla, Temple House of Kumari - the residence of living Goddess. The buildings housing Virgin Goddess has profusely carved wooden balconies from where they acknowledge greetings of her devotees. The National Museum houses a splendid collection of weapons, as well as an outstanding collection of artefacts from ancient, medieval and modern Nepal. Afternoon visit Patan and Swaymbhunath. Patan, the ancient city (Lalittpur) stands of a raised ground, 5 km southeast of Kathmandu. The main attraction is Durbar Square which has Hiranya Varna Mahavihar - the three storied golden pagoda of Lokeshwar (Lord Buddha) built in the 13th century, Rudra Varna Mahavihar - the unique Buddhist monastery boasts a fine and amazing collection of images and statues in metal, stone and wood, Krishna Mandir built in the 16th century, Jagat Narayan Temple - an imposing temple of Lord Vishnu, Machhendra Nath Temple built in 1508 AD. The Ashokan Stupa believed to have been built in 250 BC. Tibetan Centre, a self help small scale industry involved in spinning, dyeing and weaving of tibetan carpets. 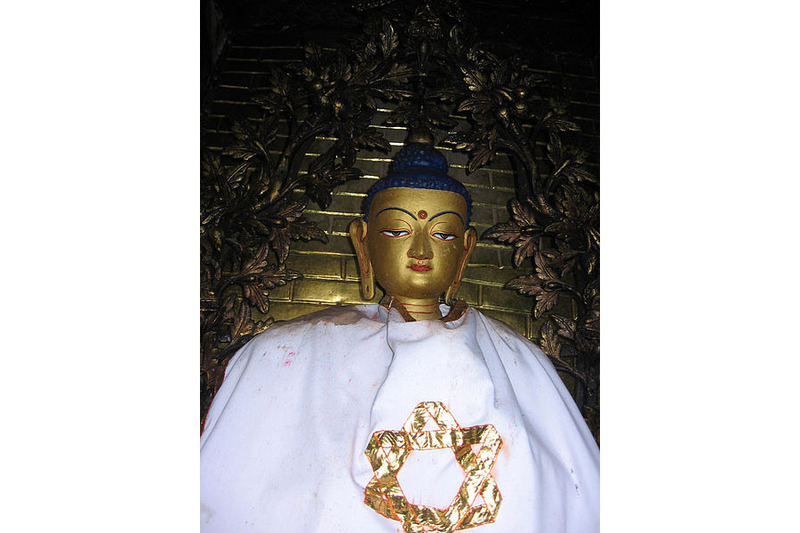 Swayambhunath - said to be 2000 years old and one of the world's most glorious Buddhist Chaityas. The Chaitya or Stupa which forms the main structure is composed of a solid hemisphere of brick and earth supporting a lofty conical spire capped by a pinnacle of copper gilt. Painted on the four sided base are the all seeing eyes of Lord Buddha. Morning visit Pashupatinath and Bodhnath. Pashupatinath Temple situated on the bank of the sacred Bagmati river is a pagoda style temple with gilt roof and richly carved silver doors. One of the most holy temples in the entire Hindu world, it is dedicated to Lord Shiv and is a centre of any pilgrimage on the day of Shivaratri. Boudhnath - the colossal Stupa, one of the biggest in the world, has the all seeing eyes of the Buddha. 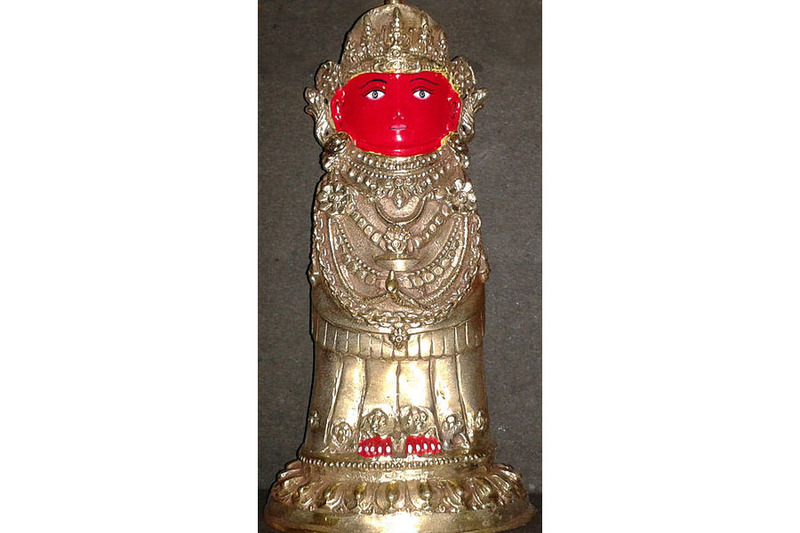 The shrine is ringed by houses of Goddess Mani Jogni. It is built on an octagonal base inset with prayer wheels and is situated 8 kms east of Kathmandu . Bungamati is a traditional and tiny Newari village from the 16th�century and is located at eight km south of Kathmandu (on the outskirts of Patan). The village has its own history and has retained its tradition and culture. It is a living museum and recalls medieval times. The farming community of Newars who live here are mostly dependent on agriculture and much of their daily activities take place outside of their dwellings. It is perched on a spur of land overlooking the Bungamati River. There are many chortens and a huge prayer wheel, clearly pointing to the syncretic nature of the Newari religion. One can see men and women sitting outside engaged in daily routine jobs such as spinning, seed crushing, weaving, carving wooden windows and doors and other traditional works. The streets are narrow that leads to central of the town where a small temple is located near a water well. Transfer to airport for flight to Paro. The flight into Bhutan takes you close to the great Himalayas, offering dazzling scenic views of some world's highest glacial peaks. As you enter Paro valley, you will sweep past forested hills with the silvery Pa Chu (Paro river) meandering down the valley below. Paro Dzong (fortress) and Ta Dzong (watchtower) on the hills above the town will be a fine sight.
. On arrival, you will be met at Paro airport, and after completion of arrival formalities you will be transferred to Bhutan's capital, Thimphu. Overnight at the hotel in Thimphu. National Library, which holds a vast collection of ancient Buddhist texts and manuscripts, some dating back several hundred years, as well as modern academic books mainly on Himalayan culture and religion; Institute for Zorig Chusum (commonly known as Painting School) where students undertake a six-year course on the 13 traditional arts and crafts of Bhutan; Textile and Folk Heritage Museum; National Memorial Chorten: The building of this landmark was envisaged by the third king, His Majesty Jigme Dorji Wangchuck, as a monument to world peace and prosperity. Completed in 1974 after his untimely death, it is both a memorial to the Late King ("the Father of modern Bhutan") and a monument to world peace. The paintings and statues housed inside the monument provide a deep insight into Buddhist philosophy. Trashichhodzong: This impressive fortress/monastery houses Secretariat building, the throne room of His Majesty, the King and various government offices. It is also the summer residence of Chief Abbot and central monk body. Handicrafts Emporium: This government-run enterprise displays a wide range of beautifully hand-woven textiles and craft products. After early breakfast, drive up to Dochu-la pass (3,088m/ 10,130 ft) provides dramatic views of the valley and mountains. A small chorten, mani wall, and prayer flags which decorate the highest point on the road. On a clear day, one can see Masagang (7,158m), Tsendagang (6,960m), Terigang (7,060m ), Jejegangphugang (7,158 m ), Kangphugang (7,170 m ), Zongphugang (7, 060 m ), a table mountain that dominates the isolated region of Lunana - finally Gangkar puensum, the highest peak in Bhutan at 7,497m. Head on towards Wangduephodrang town in time for lunch. From Dochu-la pass, it is a long, winding descent into the Wangduephodrang valley, which is about 1,700m below the pass. After lunch at Wangduephodrang town, then continue on to Trongsa across Pele-la pass (3,300m/10,830 ft), the traditional boundary between east and west. The pass is marked by a large white chorten prayer flags. There is an abrupt change in vegetation at this point, with mountain forest replaced by high altitude dwarf bamboo. Stop en route at Chendbji Chorten, patterned on Kathmandu's Swayambhunath Stupa, with eyes panted at four cardinal points. It was built in the 18th century by Lama Shida from Tibet, to cover the remains of an evil spirit that was subdued at this spot. Arrive at Trongsa late afternoon and check into the lodge for the night. After breakfast, visit Trongsa Dzong. 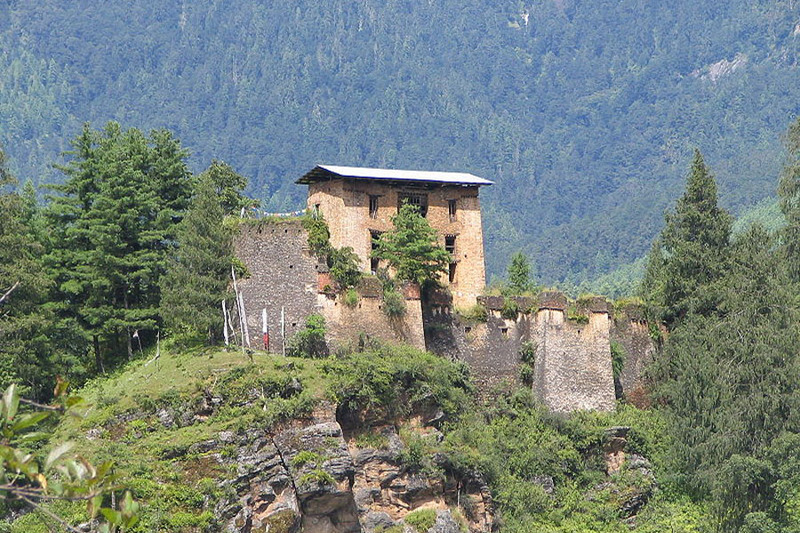 Built in 1648 it was the seat of power over central and eastern Bhutan. Both the first and second Kings of Bhutan ruled the country from this ancient seat. The Dzong is a massive structure with many levels, sloping down the contours of the ridge on which it is built. Then drive to Bumthang, 68 km from Trongsa, a journey of about 3 hours, over the Yutong-la pass (3,400m/ 11,155 ft). The road winds steeply up to the pass, 28 km from Trongsa, then runs down through coniferous forest into a wide, open cultivated valley known as the Chumey valley. On arrival in Bumthang, check in at your lodge. 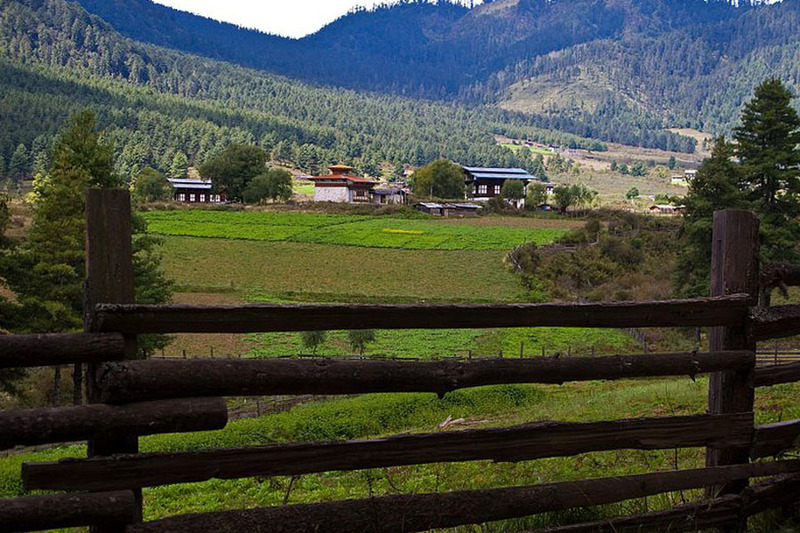 Bumthang is home to many of prominent Buddhist temples and monasteries. Visit Kurje Lhakhang, where the saint Padmasambhava subdued a local demon and left his body imprint on a rock., the Jambey Lhakhang (7th century temple), Tamshing Lhakhang (housing some of the oldest wall paintings in Bhutan) and Jakar Dzong (administrative centre of the region). Stroll in the village, visit the little handicrafts shop at the entrance to the town, and perhaps take refreshments at a local restaurant. Overnight at the lodge in Bumthang. After breakfast drive to Gangtey / Phobjikha. In the mountains east of Wangduephodrang lies the beautiful Phobjikha valley, on the slopes of which is situated the great monastery of Gangtey, established in the 17th century. The village of Phobjikha lies a few km, down from the monastery, on the valley floor. This quite, remote valley is the winter home of black necked cranes, which migrate from the arid plains of Tibet in the north, to pass the winter months in a milder climate. Explore Gangtey village and Phobjikha valley. Afternoon visit Punakha Dzong, a massive structure built at the junction of two rivers. Punakha was Bhutan's capital until 1955, and Punakha Dzong still serves as the winter residence of the central monk body. Bhutan's first King, Ugyen Wangchuck, was crowned here in 1907. The fortress has withstood several damages from fire, earthquake and flood over the centuries. The latest flood, in October, 1994, caused great damages to the fortress but miraculously spared its most holy statue. Also visit Khamsum Yulley Namgyal Chorten, the newly built stupa. After breakfast, drive to Paro en route visit Simtokha Dzong. This dzong, built in 1627 is the oldest in Bhutan. It now houses the Institute for Language and Culture Studies. Arrive Paro, check-in at the hotel. Afternoon visit Ta Dzong, which in the past served as watchtower for Paro Dzong (Rinpung Dzong) and now houses the National Museum. Then walk down the trail to visit Rinpung Dzong, built in 1646 by Shabdrung Ngawang Namgyal , the first spiritual and temporal ruler of Bhutan, the Dzong houses the monastic body of Paro, the office of the Dzongda (district administrative head) and Thrimpon (judge) of Paro district. 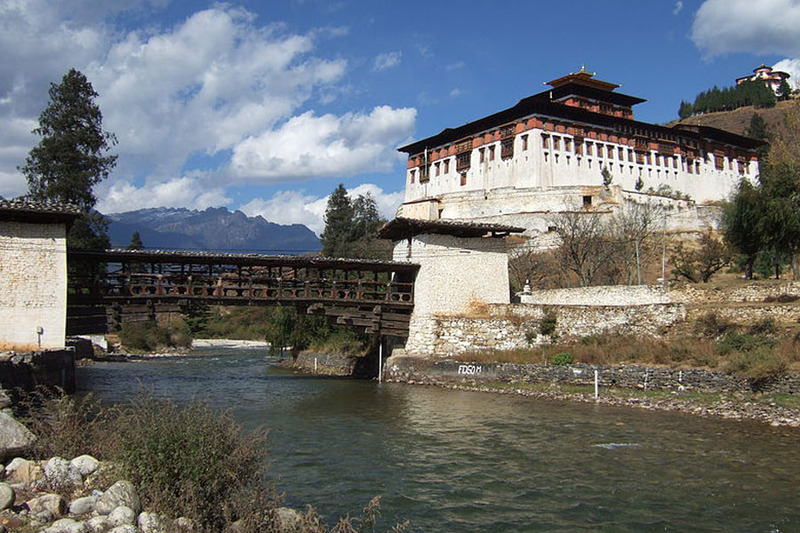 The approach to the Dzong is through a traditional covered bridge called Nemi Zam. A walk through the bridge, over a stone inlaid path, offers a good view of the architectural wonder of the Dzong as well as life around it. Famous Paro Tsechu (festial) is held here every year. After breakfast, drive up the valley to Drukgyel Dzong, built in 1647 by the Shabdrung to commemorate the Bhutanese victory over the Tibetans in war of 1644. Then take an excursion to Taktsang Monastery view point. It is one of the most famous of Bhutan's monasteries, perched on the side of a cliff 900m above the Paro valley floor. It is said that Guru Rinpoche arrived here on the back of a tigress and meditated at this monastery and hence it is called 'Tiger's Nest'. This site has been recognised as a most sacred place and visited by Shabdrung Ngawang Namgyal in 1646 and now visited by all Bhutanese at least once in their lifetime.While returning to hotel visit en route, Kyichu Lhakhang, built in the 7th century by the Tibetan king, Songtsen Gampo. Overnight at the hotel in Paro. Transfer to airport in time for flight to Delhi.